I never really had an issue with rooms smelling bad in the house except for when our guinea pig cage has to be cleaned. Now that I have a baby, let's just say that things are not always so pleasant-scented in our bedroom either. I was sent a bamboo charcoal deodorizer bag to review, so why not try it out in the room right? 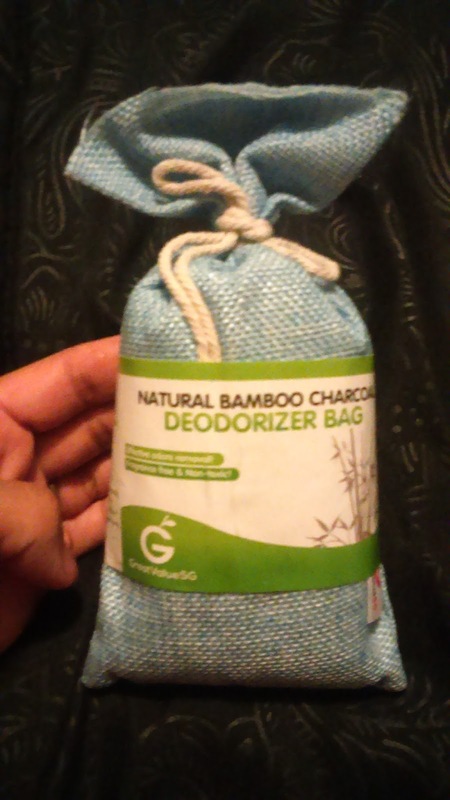 Natural Bamboo Charcoal Deodorizer Bag is highly effective in removing odors, toxic chemicals and moisture. The secret in our bamboo charcoal bags being so effective in removing odors lies in the fact that they are shipped freshly from the factory. It is fragrance free, non-toxic, safe to use at home and Eco, Pet and Children friendly. It is easy to use. Just removing the plastic bag packaging and leaving it in affected area and you should be able to notice improvements after about 1-2 days. The bag could be “rejuvenated” by placing under direct sunlight for 1 to 2 hours monthly so it is reusable for up to 2 years. After 2 years, the bamboo charcoal content can be fully recycled to be added to gardening soil so there will be no wastage. It can be used in the fridge, kitchen, closet, room, car, shoes or pet area so is highly versatile. One bag can cover up to 70 sq feet area. I had it on a shelf near our Diaper Genie, which is basically a special trash can that you stick dirty diapers in. It helped very slightly. So, what I did was place it inside of the bottom of the trash can under the bag. Did it work miracles and make the scent disappear? Maybe the soiled diapers are too strong of a scent? I don't know, but I was really hoping that this little deodorant bag would help a bit more. I placed it in the sun to "rejuvenate" it and this still did not alleviate the issue. Perhaps I need a larger one? ?